I love it when customers email photos of their parties they put together with a little help from my party printables! 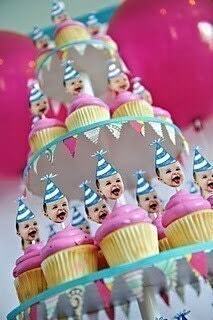 I had to share this one with you, it's a 1st birthday party Amy created for her daughter, Farrah. Amy incorporated a lot of great ideas, starting with the beautiful cake. I love the pink ombre icing! The medium size custom party hat picks from my shop and some "1s" were perfect toppers. 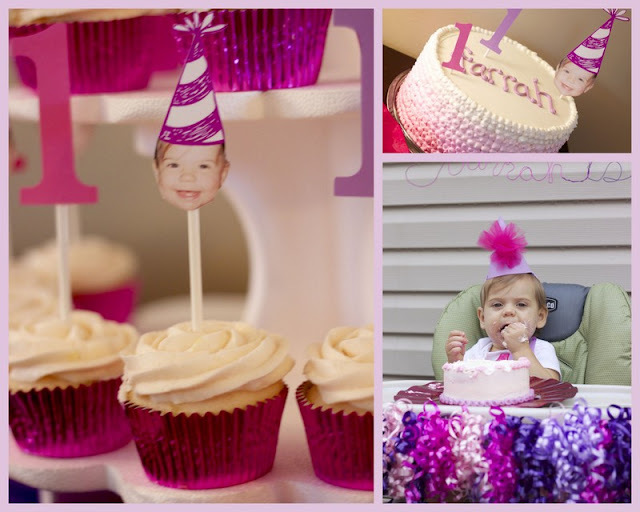 The smaller custom party hat picks adorned the cupcakes dressed in shiny pink foil wrappers. The colored wire "Farrah is one" banner hanging behind the birthday girl's highchair is so creative and you can't get more fun than the highchair decked out with loads of curly ribbon! Happy birthday Farrah! We had a fun and somewhat busy summer. Elle has been in various camps and we've done several "family fun" activities on the weekends. However, I think this summer will go down in history... well at least in my mind... as the summer of the gym and the tea. Two major new developements have occured over the course of the last couple months 1) I started going to the gym every week day and methodically tracking the number of calories I consume and 2) my nanny introduced me to her addiction... tea. #1 is not much fun at all, in fact, I wouldn't have even mentioned it if it weren't related to #2. I have a pretty serious sweet tooth and it doesn't play nice with counting calories! Enter, the nanny, her love for tea, and a really interesting site to buy tea from, adagio. On adagio, users can buy tea but they can also make their own custom blends (some of them get pretty creative and make blends inspired by movie characters... like the Harry Potter ones you see above), design their own artwork for their blends label, and make their creation available to be purchased by other users. With teas like chocolate mint cream, I feel like I'm cheating the system somehow by getting my sweets fix in tea every afternoon for virtually no calories. I didn't post about this just to tell you how much I love the site and my new found sweet fix though... I wanted to share this fun project for "stained glass" jars that my nanny did with my girls. First, they came up with a color scheme for each flavor of tea (like peach and white for a peaches and cream tea) then they tore bits of tissue paper in those colors, dipped them in water, applied them to the outside of the mason jar, and smoothed them down. Repeat, overlapping the tissue paper just a little until the entire surface of the jar is covered. Then paint white glue over the whole thing and let dry. Lastly, once the tea you tracked online through the entire shipping process and waited for with bated breathe (that's what happens when these things get to addiction level) arrives, pour it into the jar, peel the artisan's label off the bag of tea, and adhere it to the outside of the jar. Store your jars in a cool dry place. We took advantage of the tax-free weekend here in Florida and bought school supplies. My soon-to-be 7 year old is going into 1st grade so it's the "real deal" this year, evidenced by the staggering number of school supplies we had to hunt down! Elle had fun picking out her favorite notebooks and colors for her folders but I saw an opportunity for creativity and promised her "something fun" if she would pick some solid color binders. I'm pleased to say Elle thinks I delivered on the "fun" and you can get in on it too because I made you a printable! 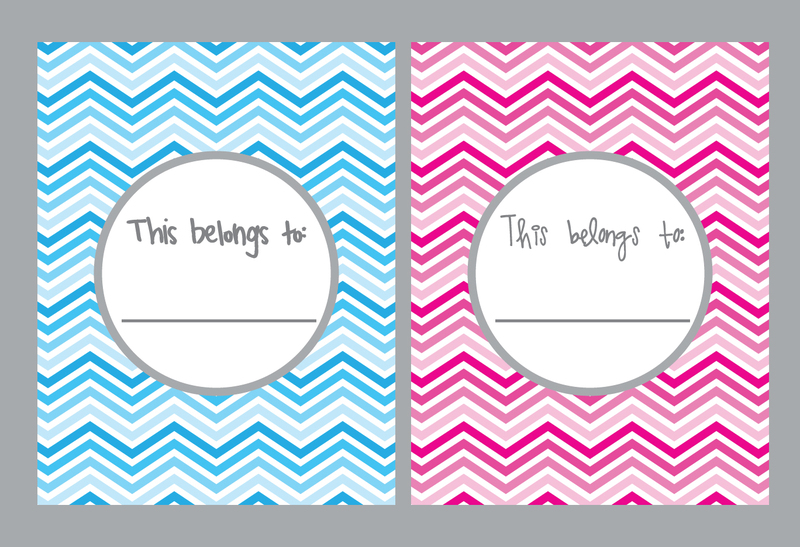 I designed a "this belongs to" coversheet with chevron background. 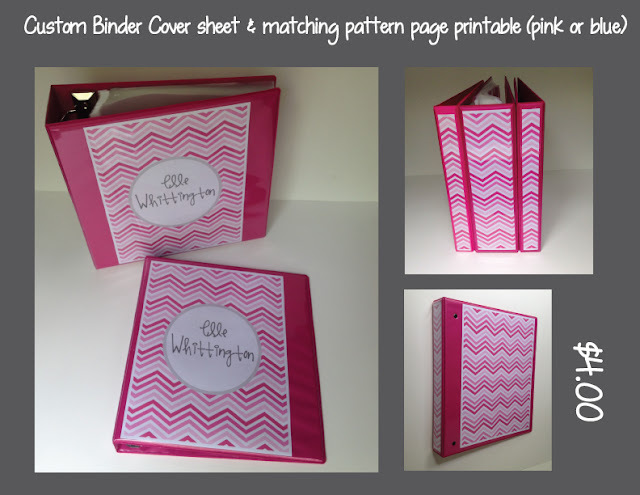 You can insert it into binders that have the clear pockets on the cover for an easy and cute way to label them with your kiddos name. I made a pink and a blue version for you. Click blue or pink to download them for free. Yea for free printables! But, if you're like me, and gently coax your kid into selecting coordinating color combinations for their folders, scour Etsy to find just the right design for name labels to apply to your kid's supplies, and wonder to yourself if the shade of pink she picked for her notebooks will match her backpack... or even if you're less crazy than I am and just like cute stuff, you can order a custom version of this file in my Etsy shop. You'll choose pink or blue and get 2 files with your order. The first will be your kid's name in the center of the cover design and the second will be just the chevron print. I printed two sheets of the chevron by itself for Elle's binders, cut 1 for the spine and inserted the other in the back of the binder. Now I just have to figure out how my 7 year old is going to carry all of this into school with her on her first day!